NRS Publications, the publishing company based at Hyderabad, Telangana, India, is publishing a group of magazines on Poultry and Aquaculture sectors - Aqua International, the leading national monthly magazine in English language since 1993 and Poultry Fortune, the leading national monthly magazine in English language since 1991. Both the magazines are popular for quality and standards with largest readership in India. 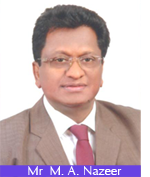 Mr M. A. Nazeer is the Editor, Publisher and Owner of the publications. Aqua International also organise conferences, forums and awards functions on aquaculture sector. Aqua International strives to be the reliable sources of information to the stakeholders of aquaculture industry in India. Aqua International will strive to be the forum to the stake holders of the industry to discuss for the development and self-regulation. Aqua International recognizes the efforts and contribution of individuals, organizations and institutions for the development of aquaculture industry in India through annual AI Awards presentation.